Note: This is an older article and kept for reference. As of March 20, 2017 it is currently unavailable. Price on June 3, 2015, was $4,093.19 USD. While checking out Amazon we came across an interesting sale on the 7482P Weiand Supercharger Kit. This is the classic 6-71 blower which is designed to generate 50+ percent more horsepower and torque across the RPM range. The included pulleys will generate 11 to 12 Psi boost on a small block 350 engine. 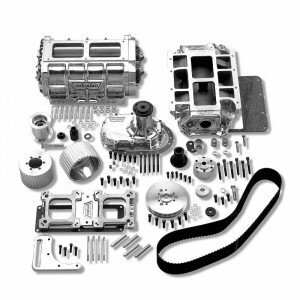 The 7482P Weiand 6-71 Series Supercharger Kit comes complete and ready to bolt on to 1955-1986 Chevy small blocks that have a small cap distributor with short water pump and accessory brackets. Amazon’s sale for the kit is $2,923.98 USD. The nice thing with Amazon is potentially free shipping and 12 month financing if you use the Amazon store card. If you’re not interested in Amazon’s free shipping and financing then JEGS has the same kit on for $14 cheaper. Check out the Amazon page for more details and a handy list of vehicle’s that are compatible with it.